A documentary feature film on the life of Julian Eltinge, the great American female impersonator of the early 20th Century. "Lady Bill... The Story of Julian Eltinge"- Featuring Dr. Laurence Senelick, Fletcher Professor of Oratory and Director of Graduate Studies, Tufts University Drama Department. The New York Foundation for the Arts (NYFA) is the project's official Fiscal Sponsor for our funding applications to the National Endowments for the Arts and Humanities, and New York State Councils for the Arts and Humanities- as well as those to major nonprofit foundations and trusts such as the Guggenheim Fellowship, the Arthur Vining Davis Foundation, and the Pew Charitable Trust. Here is a redacted copy of our project narrative submitted last year to the Guggenheim Fellowship. We hope that you might take time to read through it- we made it as brief as possible while still making it somewhat informative! In 1917, Mary Pickford and the great Broadway female impersonator Julian Eltinge completed shooting of their first motion picture together, at the now legendary Lasky-Paramount Studios in Hollywood, California. Pickford, America’s Sweetheart of the early Silent Screen, lovingly dubbed him “Lady Bill”. In those halcyon days, such was the esteem in which Julian Eltinge was held by his fellow actors, as well as his millions of fans, who called him "Mr. Lillian Russell". No one would have predicted that in ten short years, Julian Eltinge- once the highest paid theatrical performer in the world- would be literally driven out of the entertainment industry. Eltinge's illustrious career had started in Boston in 1904, when the reluctant teenager, spurred on by his world famous dance teacher Lilla Viles Wyman, first stepped onto the stage of the Tremont Theater in the play "Miss Simplicity"... in the role of a woman. As Mrs. Wyman predicted, the boy- who was then known as Billy Dalton- was an overnight success. He was signed almost overnight to a contract by Boston theatrical promoter Edward E. Rice, at a jaw dropping starting salary of $100 a week. The following year, he signed an extended management contract to go on the national Vaudeville circuit. The next stop was Broadway, and management by the great Al H. Woods, who had a theater built on 42nd Street with Eltinge's name on it. 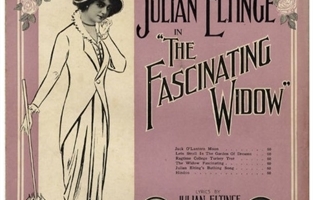 At many junctures, Billy Dalton, who assumed the stage name of Julian Eltinge, tried to escape playing female roles. As a compromise, he decided to assume both the male and female leads in all of his plays. The decision obliged him to make as many as thirty-five costume changes in a single performance. It is hard for today’s theater goers to imagine how a six foot tall, 160 pound man could transform himself into the persona of a Lillian Russell with an eighteen inch waist. But Julian did it over and over, year after year, in almost every city and town in the United States reachable by train. Like a 1960s Rock Star, the announcement that Eltinge was coming to town set off a frenzy among the local shop girls and housewives who comprised 95% of his devoted fans. His performances were sold out within hours. The money rolled in- and after a while there was no turning back. Town houses in Manhattan, a beach estate in East Hampton, a castle in Hollywood, and a ranch in San Diego – most of all, the look in the eyes of his proud parents. Giving it all up would mean sending them back to a life of poverty. To Julian, that simply was not an option. Especially difficult were the promotions featuring Julian in boxing matches, and barroom fights that arose out of the persistent accusations that he was a homosexual. Eltinge went out of his way to avoid such confrontations, but his fame and notoriety had made him a prisoner. Unable to move about freely in public, he threw himself into publishing The Julian Eltinge Magazine for Women. He founded his own cosmetics company. He co-wrote hit musicals with the contemporary giants of the theater, including Jerome Kern, George M. Cohan, and Otto Hauerbach- and toured throughout Asia and Europe. Eltinge maintained a grueling work schedule, deprived himself of personal relationships, and devoted himself to his parents, leaving nothing for himself but a pile of riches that just couldn’t hug back. Then, a tidal wave of pain washed over the shores of America in the form of World War I, followed by the Stock Market Crash and the Great Depression. Americans were hurting, and wanted to fix blame for their collective misfortunes. Prohibition, religious radicalism, and a national obsession with stamping out vice replaced rational thinking. Laws were passed in State after State making it a crime for a man to wear female attire. Eltinge soon became persona non grata in Hollywood. The final blow came when Eltinge was arrested for performing in a Los Angeles night club for standing next to a female mannequin dressed in one of his outfits. Eventually, he lost everything. He died in New York in 1943, following a performance in his old friend Billy Rose’s Diamond Horseshoe Revue. His funeral was held by the Lambs Club at New York's Little Church Around the Corner. More than 1200 members of the theatrical community crowded into the service. All of them hailed Eltinge as the greatest American stage performer of their day, but no one could speak of Julian Eltinge, the man. Nobody had ever taken the time or opportunity to know him. Eltinge is referenced in many books of "drag" theatre history by advocates of the transvestite lifestyle. 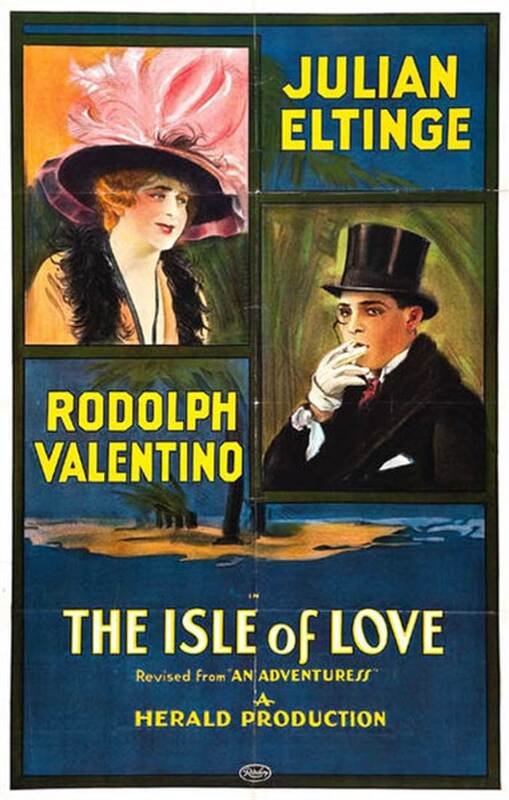 He is usually dismissed as a closeted homosexual, who had affairs with many actors- including Rudolph Valentino. 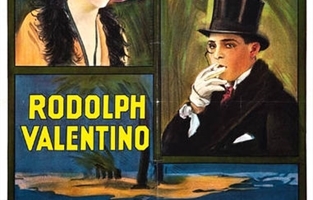 One book claims that Eltinge was the anonymous "Lady in Black", who visited Valentino's grave each year on the anniversary of his death. The stigma of being labeled as a social outcast follows Eltinge to this day, suggesting that he committed suicide. Not only was Julian Eltinge a victim of the gender prejudice that raged in America during the 1930s, but he continues today to be a victim of journalistic distortion. It has taken years to uncover the threads of Eltinge's private life, but we have finally located family and relatives of friends, many of whom retained both his possessions and letters. Every bit of evidence points to the fact that Julian Eltinge was not a homosexual. In fact, fear of public condemnation transformed Julian Eltinge into a man with a distinctly asexual personality, who poured his soul into the perfection of his art- which in the end, in spite of all his efforts to maintain its legitimacy, became the object of ridicule and hate. This makes his tragedy perhaps even greater. 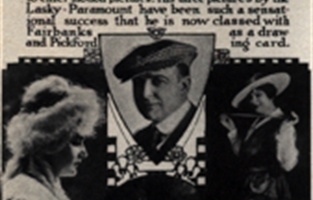 No documentary film has ever been produced on the subject of Julian Eltinge, his contribution to the classical theatrical heritage of the male performer in female roles, and his influence on American popular culture. His bittersweet life story epitomizes the tragic effect that the intolerance of taste and changing social attitudes can have on those who are obliged or decided to compromise themselves to them. More than four years have already been invested in the development of Lady Bill. An extensive search has been conducted in the Archives of the Museum of the City of New York, The Billy Rose Library, the Academy of Motion Picture Arts and Sciences, and the George Eastman Film Archive, to insure that sufficient archival materials exist for the creation of a visual presentation. Our research has yielded hundreds of still photographs, eight full-length motion pictures, performance footage, and the sheet music of over thirty songs written by Eltinge with Jerome Kern, Otto Harbach, and George M. Cohan. Many wax cylinder and 78rpm recordings of music from the plays and movies in which Eltinge appeared have also been located. We will restore these recordings to the best possible quality and generously employ them in the film. Martin Litvin, the well-known scholar of the Progressive Era, wrote an unpublished biography of Julian Eltinge, based upon an archive of Eltinge memorabilia collected over a period of thirty years by the former curator of the George Eastman House in Rochester, NY. Mr. Litvin’s widow has turned over to us both his manuscript and the archive, and has authorized us to use it in the scripting and production of our project. Research has been completed. Key archival materials such as motion pictures, photos and newspaper articles documenting the entire career of Julian Eltinge have been secured, as well as music rights. We have also photographed and transcribed a key interview with Dr. Laurence Senelick, Fletcher Professor of Oratory and Director of Graduate Studies at Tufts University Drama Department, and author of renowned books on gender in performance. A number of key locations in New York, Massachusetts, California, and Montana will be photographed, as well as interviews with Eltinge's descendants. Celebrated contemporary performers will be contacted to solicit their participation in the film as interviewees, and will offer their informed opinions on present day issues of gender in dramatic performance. The finished film will feature both a narrator and a voice artist reading the words of Eltinge in character- we are actively pursuing David Hyde-Pierce and Kathy Bates to narrate, and Tom Hulce to play Eltinge. Examples of the specific visual techniques which we will employ include “Then and Now” transitions, three-dimensional multi-planing of still photographs, and compositing/rotoscoping/color matching of archival materials. These techniques, combined with interviews and primary and secondary source materials, will bring the story of "Lady Bill" to life.